Ever since its origin in the first years of the 17th century the Spanish Hall has been the most important stateroom of the New Palace of Prague Castle. The Emperor Rudolf II for his collections of art and curiosities built it. During the reigns of later sovereigns it was the principal hall of the court for banquets, balls and coronation festivities. In the four hundred years of its history the Spanish Hall has been a witness of a number of diverse events. A Royal Banquets were held here in 1620 by Frederik of the Palatinate for the high nobility and commoners on the occasion of the christening of his son Ruprecht. A masked ball took place here, too, in 1680, in the style of a rural wedding, during the reign of the Emperor Leopold I. Towards the end of the next century, in 1791, a court ball was held here and homage was paid to Emperor Leopold II before he was crowned King of Bohemia. And, in quite a different style, the trade-samples fair, attended by the Emperor Francis and his consort Caroline, took place here, in 1833, in the early industrial age. 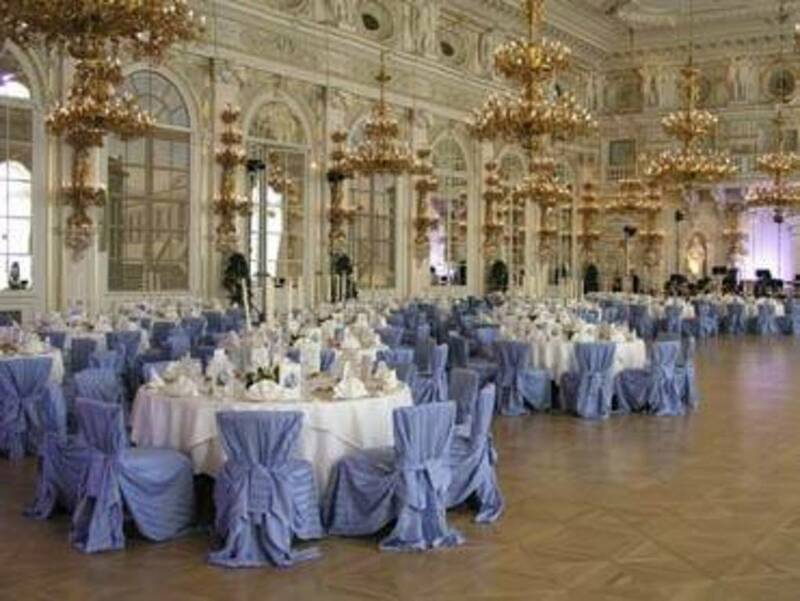 After the birth of the Czechoslovak Republic, in 1918, the Spanish Hall was the scene of large tea parties at which President Masaryk met with representatives of the broad spectrum of public life and banquets were held for participants in international congresses. The tradition of exceptional events in the Spanish Hall has been preserved throughout the centuries and continues to this day. The Spanish Hall, as it is clear from the plans of its builder, was originally intended for Rudolf´s sculpture collections. Adjoining it to the Prague Castle Gallery, originally built for Rudolf´s collection of paintings. Originally, the two halls differed in appearance, but with the alterations carried out in the course of four centuries they have become almost identical. On special occasions, the rooms are opened up making practically the whole north wing of the Castle accessible. The relief decoration of both interiors is particularly elaborate. In the Spanish Hall it retains much of the original appearance given to it by the Italian artist whom Rudolf II employed at the Imperial court. The Emperor´s monogram is visible in the stucco decorations as is a relief faxe composed of fruit and foliage, in the style of portraits by Arcimboldo, perhaps the leading painter at Rudolf´s court. Later reconstructions and adaptations were carried out as part of preparations for the coronation of Bohemian kings and also to repair damage caused by wars and fires. The mirrors on the walled-up niches on one side of the Spanish Hall, for example, are a reminder of the last coronation to take place in Bohemia, namely, that of the Emperor Ferdinand and his consort Marie Anna in 1836. The mirrors on the niches and illusionist windows, gilded chandeliers, and lightning on the walls all contribute to the splendour of both halls. Capacity of the Spanish Hall is 550 people in banquet and reception style.